Anyone can make a beautiful table for their Thanksgiving dinner, even if they don’t have any crafting or decorating ability. 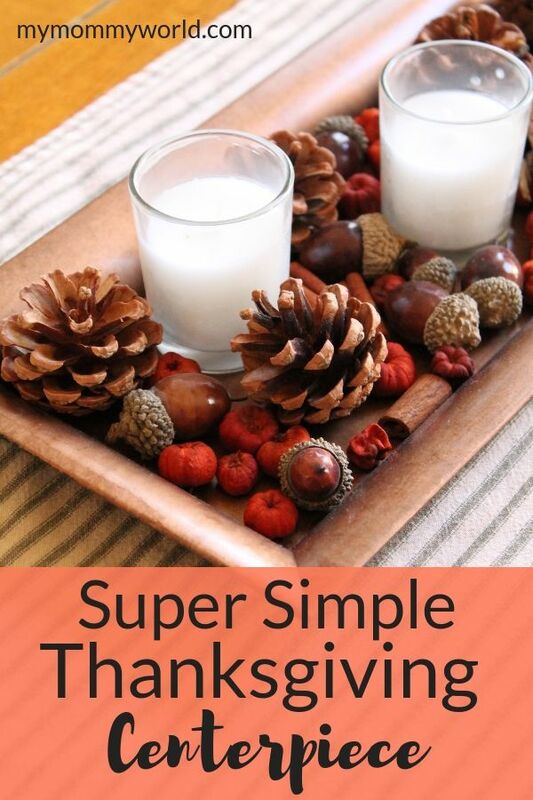 Make a super simple Thanksgiving centerpiece with just a few simple pieces that will wow your friends and family. Did you look at the calendar this week and realize that Thanksgiving was in less than 2 weeks? That was me this past Monday. And I panicked a little. On the plus side, Thanksgiving dinner will be just my immediate family here at our house, so there wasn’t any guests to get ready for. But there was a big dinner to prep and shop for, and the decorations to figure out. I don’t have a ton of fall-themed decorations, but I’ve really made an effort to make our home and table a little more festive, in order to make meals…and especially holiday meals…more memorable for my kids. And while I just love scrolling through Pinterest in order to get ideas for decorating my home, I don’t usually have the craft skills…or time…to pull off most of the projects I see. Especially this year, when Thanksgiving is like a whole week earlier than usual. So I took a trip down to my local craft store and found some really easy pieces that I used to put together a simple, but pretty, Thanksgiving centerpiece. Please note, this post contains referral links, which means that I earn a small commission if you make a purchase. The craft store is pretty much like Pinterest in real-life, so it was a little hard to figure out what to buy, but after a few minutes, I was able to pick out a few things. I found a really pretty bronze-colored tray, a bag of pinecones and wooden acorns, and a package of votive candles in small glass jars. The reason I went for these items in particular is because they will fit on my small dining room table, and because they aren’t too tall. Sometimes I find that Thanksgiving centerpieces, while beautiful, block out my view of the person sitting across from me, and then I have a hard time talking with them throughout the meal. With a flatter centerpiece, you still have a pretty table, but can see everyone (and there’s more room for food. If you don’t have time to go to the craft store, you can make this centerpiece with any plate that will fit your table. You can gather up some pinecones from the yard (making sure they don’t have any sap on them! ), or order some pinecones and acorns online. You don’t want to get any acorns from your yard to bring inside, however. A friend once told me that she did that, only to find some worms hatching out of the acorns while they were sitting on her table. Yuck! 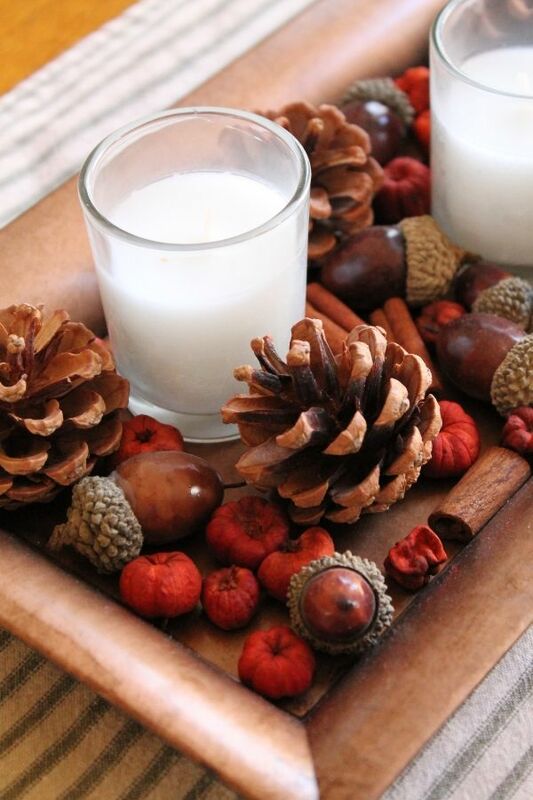 Just arrange a few of the votive candles on the tray, then add in some of the pinecones, and sprinkle on the acorns. I also added a sprinkle of some pumpkin potpourri that I had on hand already. It’s made from dried putka pods, which look just like miniature pumpkins, and pieces of cinnamon sticks. Set the tray in the middle of your dining room table and you’re done! 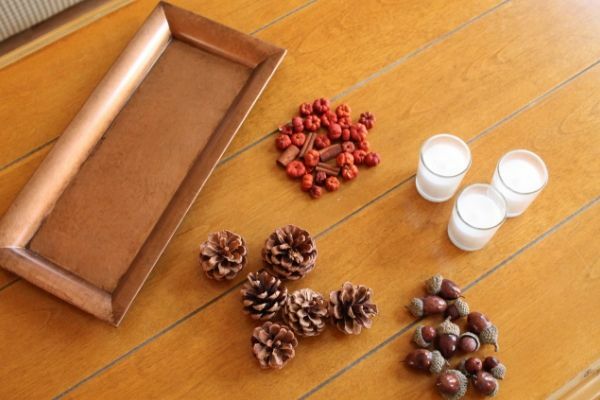 If you have a longer table, you can make several trays of candles and pinecones/acorns to run the length of your table, and then everyone can enjoy the soft candle light. Looking for some ways to use up that leftover turkey after the big day? Check out all the ways to use up your leftovers…the Turkey Corn Chili is my favorite! Such a simple and pretty centerpiece. I love your addition of potpourri to the centerpiece.